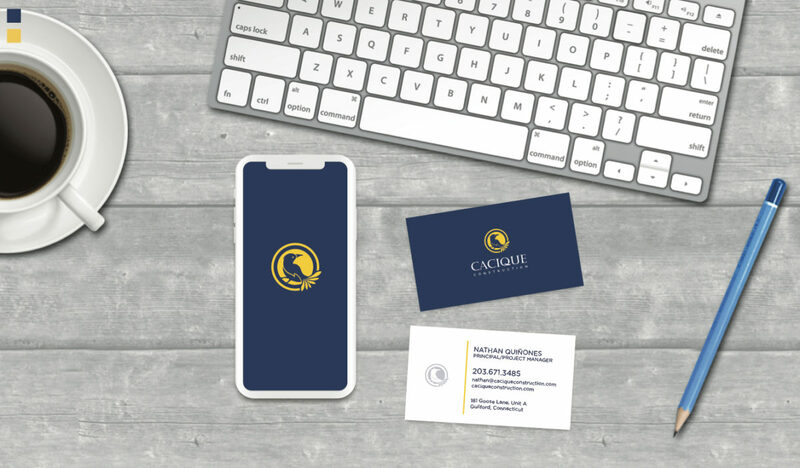 With more than 15 years in the high end home design and construction market along the Connecticut Shoreline, Cacique Construction decided it was time to give themselves a proper Brand Mark. They asked for something meaningful and finely crafted, that would tell a story not just about who they are and where they come from, but one that would also cast an impression of quality and beauty. 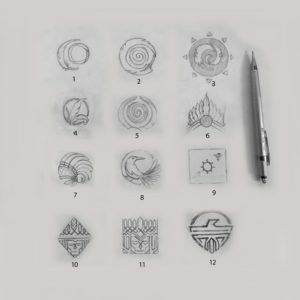 It’s only natural to want an insignia or brand avatar that is both lovely to look at and meaningful. They want their customers to feel a sense of pride and respect when sharing the news about who remodeled their kitchen, or built their home from the ground up. The word “Cacique”, as our team learned, is a native Puerto Rican word for their Tribal Chief, and also a name commonly gifted to a beautiful jungle crow that is native to those lands. 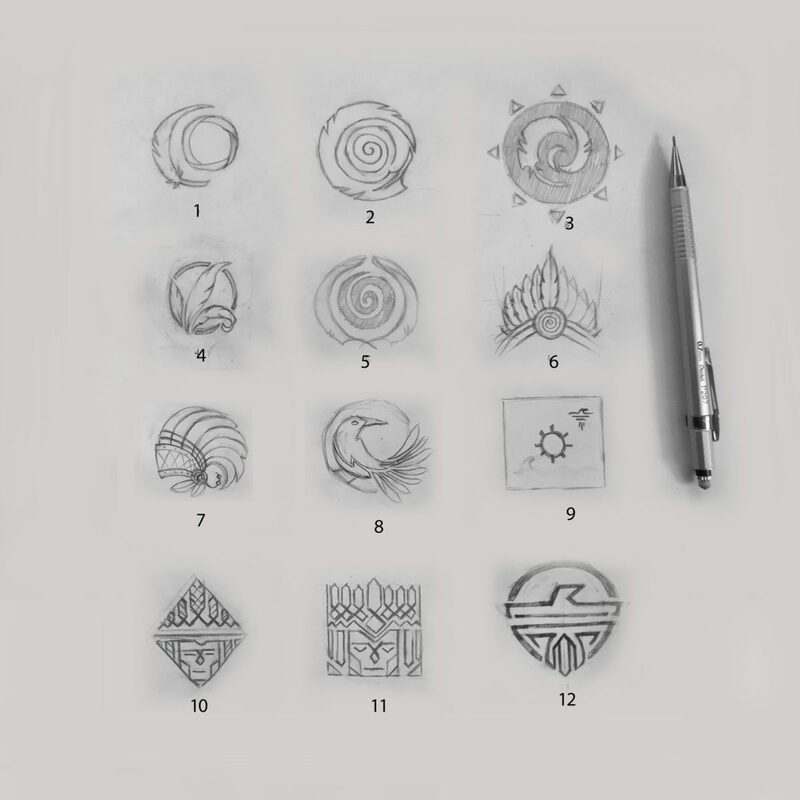 The Crow Avatar came to us right away in our early rounds of sketching and idea exploration and was the perfect fit conceptually and graphically. Any brand idea that is a totem or avatar animal is always a dream to work on. The challenge for our illustration team was the finely tuned curves and shaping of the bird and feathers itself so that is could stylistically resemble the Cacique Bird, and yet still flow into a cohesive logo shape. Containing an avatar inside some kind of frame or circular element is often a more graceful way to host the little creature so it can settle visually into some suggestive environment. 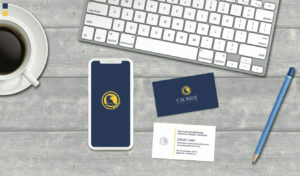 A Brand and Website That Match. The real reason we were first contacted was to beautify and enhance the function of a web interface they purchased from another regional vendor. No name dropping, but let’s just say that they could tell they were not getting the quality of design they were paying for, and that best represented their own philosophy in business and brand aesthetic. Our speciality is design & strategy first, and then seamless production into what ever medium; web, email, social, video or print. As apart of any good website build, your branding team should ask you about the conditions of your photography. In this case, they had a mountain of imagery spread through out facebook, houzz, and some raw materials. We ran our streamlined photography production process through their entire catalog of imagery. A catalog which featured dozens of projects and nearly 350+ photographs, all required to categorize, web optimize, keyword name, and thoughtfully organize into the page displays. Whew! This work is often so daunting, that it holds back many business owners from revamping their platform, because honestly, who is going to sort through all of those images!!! We have a long history of building mega sized portfolio websites, and so we have our own patented process for delivering this kind of volume of imagery import/export. The best part of this build, was that since we did the logo design and photography production, the steps to integrate into the website were seamless. The platform went together in record time, on spec with the scope, and inline with the quoted budget all well before any anticipated deadlines. As an agency that loves to design and dream up illustrations, the best part of building a serious website presentation is the info graphics. We brought to life custom graphical scenes that teach the user a bit about their various processes of construction. From the first idea session to auto cad, then on to permitting, lining up material costs and then…boots on the ground, cutting, nailing, tiling, and fabricating on site. With complete creative freedom given by the customer, we were able to create this branded collection of infographics that marriage beautifully next to image galleries and explanatory narrative. As some one that reads a lot, I know that a little photo or illustration once in a while really does help teach us faster and give our eyes something to be drawn to. 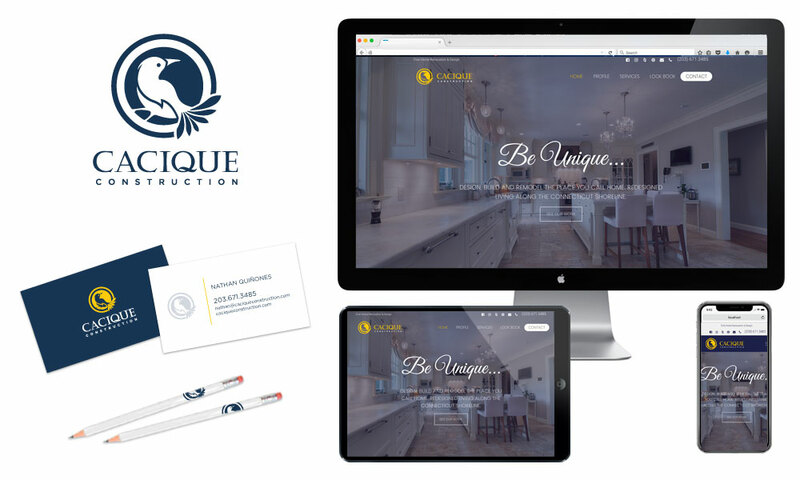 With a brand to call their own, and a web platform that never sleeps, the team at Cacique Construction now have the tools at hand to start the next level of business growth and prestige in their market. Stay tuned for more branded media in the works now as we sink our teeth into their next pieces of media, signage, apparel, and vehicle decals! Shout out… Anyone looking for one of the very best Design-Build teams in the Guilford CT area, look no further.